Rudos took 1/3. 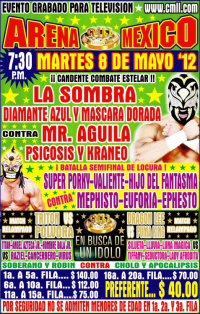 Mephisto pinned Dorada and challenged for Dorada's title. Event Notes: said to be a poor turnout. 4) Guerrero Maya Jr. & Hijo del Fantasma vs ? The Stigma/Milenium/Asturiano trio all wore red. Puebla tecnicos took falls 2/3, with Skandalo fouling his brother Stigma in the last for the DQ. Rudos took 2/3. Maya was cut open sometime in the second and said to bleed significantly during this match, though he refused medical attention. Rudos eliminated him in the third. 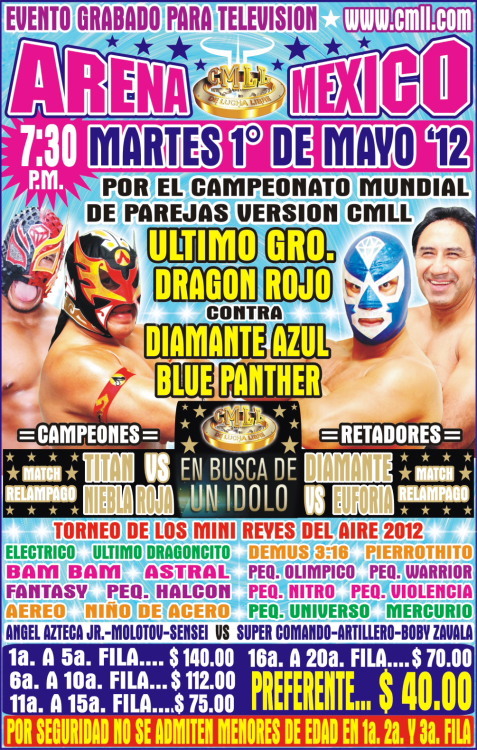 Atlantis got Olimpico up in the Atlantida, but Volador broke it up, pulled the mask, and cradled Atlantis for the win. Volador also attacked Maya as he was being strechered out after the match. Tecnicos took falls 2/3. Rush pinned Tiger. Maximo suffered a leg injury in the third fall. Javier Cruz Sr. was watching his son's match. Rudos were DQed for excessive violence and kept going, so Cruz Sr. hit the ring for the saev. Evola ran out to help the rudos, and Evola and Cruz Sr. made hair match challenges. Tiffany must've cheated to beat Silueta, because Silueta demanded a singles match for next week. Dorada took 2/3 to keep the title. Said to be a very good match - Apolo Dantes called it one of the best matches in the arena in many years. 2) Artillero, Disturbio, Súper Comando b Molotov, Robin, Súper Halcón Jr.
Rudos took 2/3. Said to be a bad match. 4) Ephesto, Euforia, Mephisto b Ángel de Oro, Delta, Guerrero Maya Jr.
5) Atlantis, Diamante Azul, Shocker DQ Kráneo, Psicosis, Volador Jr.
Volador attacked Atlantis early, but the tecnicso still got it together took take fall one. 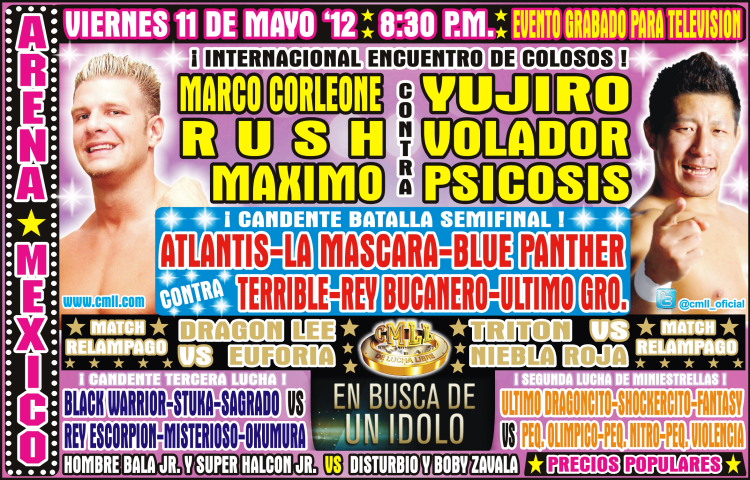 They also took fall three, when Volador broke up an Atlantis pin on Psicosis and fouled him for a DQ. Atlantis demanded a singles match next week with no Tirantes. 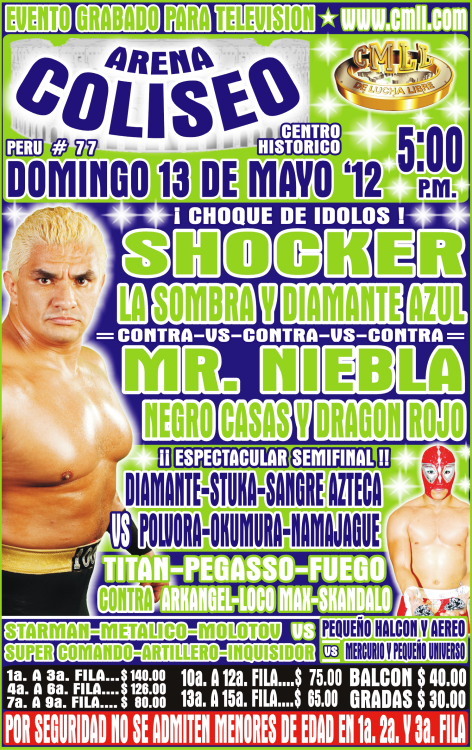 Stuka replaced Titan, who was double booked in Mexico City. Estrellita asked for the hair vs hair match. Niebla slipped in a foul in the third, setting up a singles match for next week. Niebla attacked Rush before the bell, then won two straight. The last was Niebla sneaking a foul on Rush. Rush demanded a singles match next week. Rudas took 2/3, with Tiffany beating Marcela in the third. 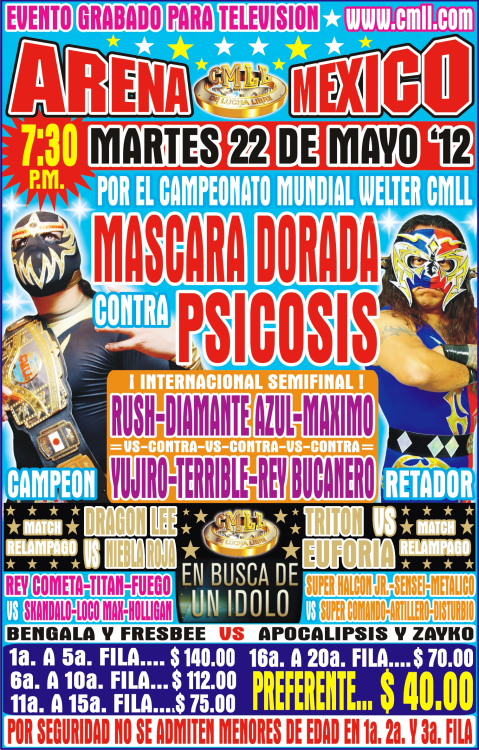 Puebla vs DF cibernetico. There was nearly a brawl before the match, and Pegasso tried to make peace between the sides. Eliminations were Millenium (Super Comando), Hombre Bala (Espiritu Maligno), Puma King (Asturiano), Arissma (Super Comando), Espiritu Maligno (Skandalo), Pegasso (Stigma), Skandalo (also Stigma! ), Arissma and Puma King eliminated each other on a double countout, Stigma (Dragon Lee), Lestat (pulling Dragon Lee's mask to pin him.) Everyone argued post match, leading to the cage match next week. 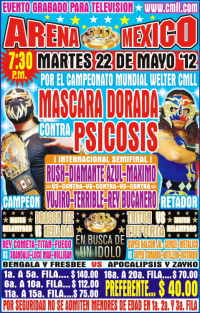 Rudos took 2/3, Psicosis pinning Delta in the last. Atlantis had issues with Volador and Tirantes. Volador took the first, Atlantis took the second. Volador found the strechered and started hitting Atlantis with it. (Proof he's a Parka!) Atlantis grabbed the strecher, so Volador used a cameraman as a human shield. Both went for the masks. No pinfall, instead Psicosis, Mr. Aguila and Olimpico all attacking Atlantis. Sombra, Guerrero Maya and Delta ran out for the saves, but the rudos destroyed them and took their masks. Invasors challenged for a trios title match. Gallo & Misterioso feuded. Sagrado & Escorpion double pinned for the draw. This sets up a rematch last week. 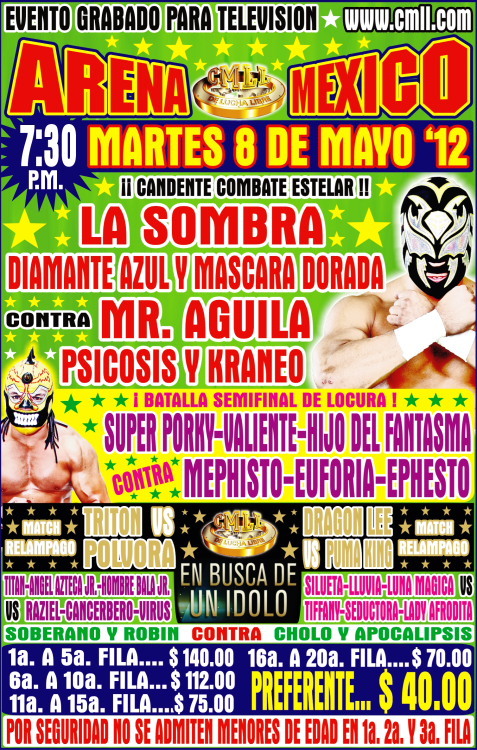 Rudos took 1/3, Dragon on Sombra and Volador on Mascara. That last sets up a rematch. Best match of the night. 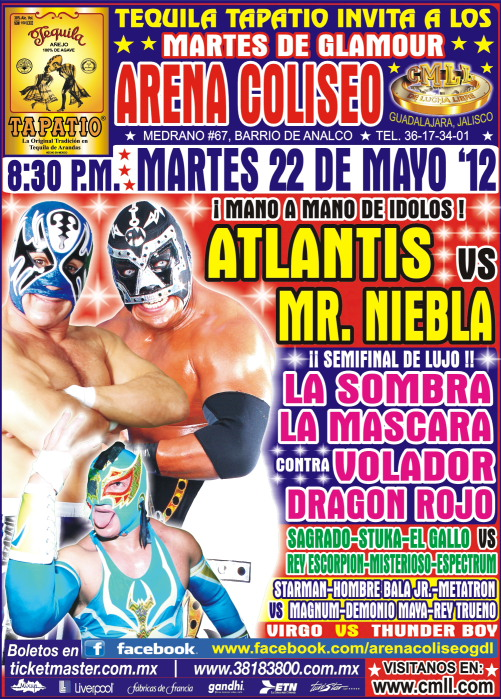 Atlantis took 2/3, Mr. Niebla pulled Atlantis' mask. 5) Hijo del Fantasma, Máximo, Rush DQ Dragón Rojo Jr., Mr. Niebla, Volador Jr.
Niebla fouled Maximo for kissing him. 1) Conquistador Místico & Mr. T Jr. vs Extrem Fury & Galactus Jr.
1) El Tackle & Rey Fobia vs Mr. Guerrero Jr. & Scriba Jr.
Niebla took 1/3, faking a foul in the third. Tecnicos took 2/3. Yujiro fouled Rush. 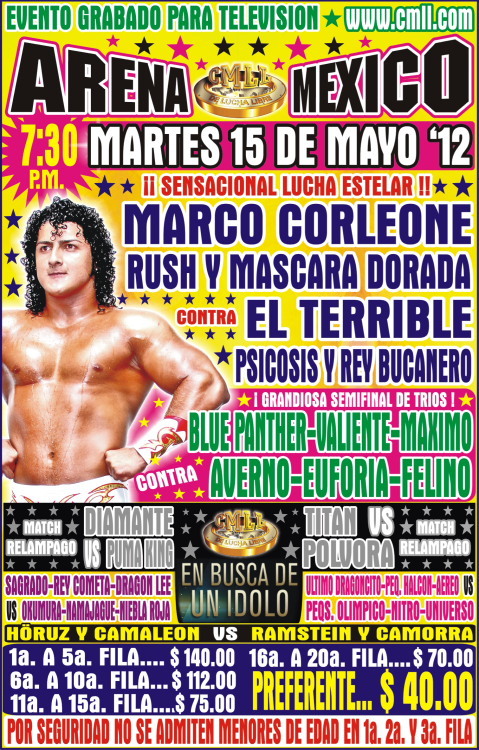 Volador replaced Olimpico. Mije was with the rudos. Rudos took the first, then Volador threw Mije off the top rope and Mije had to be strechered out. Tecnicos rallied to win the second. Atlantis won the third himself, pinning Aguila with a 'rana and again submitted Volador with an Atlantida. Fifth (known) defense. Order of escape was Millenium, Hombre Bala Jr., Pegasso, Espiritu Maligno, Skandalo, Lestat, Dragon Lee, Asturiano, Super Comando and Stigma, leaving Puma and Arissma in a one fall finish. Both looked tired. Arissma applied a caballo, but Tirantes was distracted. Arissma got up to argue with him, and Puma locked him in a casita for the three count. Arissma revealed himself as José Luis Guevara Carrera, 42. First apuesta win for Puma King. 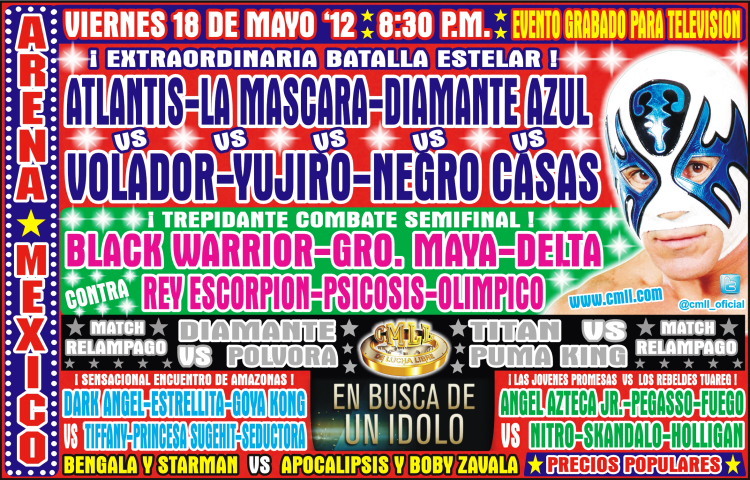 Acertijo & Infierno beat Divino, but Virgo came back to beat both. Titan beat Arkangel to win the tournament. After the two teams went to a draw last week, Rey Escorpion fouled Gallo this week. Mascara retained his title. Rey Escorpion & Stuka were seconds.